Power, paint and better traffic flow, all at a minimal cost, have made Level I of the Woodruff Library more functional and fashionable. The newly refurbished area has a casual group seating area and 22 new power options, including activated or newly installed outlets at each table to accommodate laptops and chargers, according to Charles Forrest, director of library facilities for the Emory Libraries. 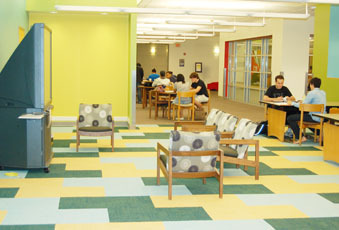 "Our students tell us they want comfortable seating they can arrange as they need for individual or group study. Power is a top priority for plugging in laptops and charging phones and PDAs,” Forrest says. Working with University Technology Services and monitoring the Woodruff wireless footprint through the busiest parts of last year’s semesters, the library added four wireless access points to Level 1, with a potential simultaneous load-carrying capacity of 120 users. On Level 7, UTS added two access points with a simultaneous load-carrying capacity of 60 users. The additions ensure smooth surfing for wireless users in both locations, says Alan Cattier, UTS’ director of academic technologies. Jazzman’s Café, the study area on the same floor, is now jazzed up with red, violet and green, replacing the previous beige, brown and white. The main wall facing Jazzman’s promotes creative expression and communication among library users with broad strips of “whiteboard” paint on which users can write with erasable markers. So far, the boards are being used for note-taking at group project meetings, writing invitations to events, scribbling Scripture and sketching portraits. Other Level 1 upgrades include the relocation of the service desk and microfilm and fiche reader-printers closer to cabinets holding the microfilm and fiche collections. Level 1 is open 24 hours between noon on Sundays and 8 p.m. on Fridays; and from 9 a.m. to 8 p.m. on Saturdays.